Last year I attempted the 2014 Holiday Challenge, but never fully committed. However, it was a great personal achievement as, for the first time in my life, I purposefully spent time thinking about my relationship with food and living a healthy lifestyle. This 2015 Transformation it was time to put that knowledge and insight to use. 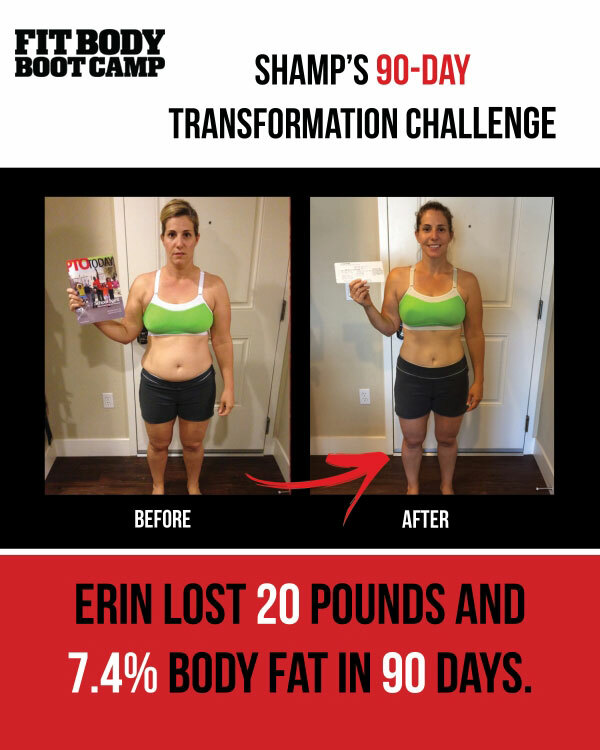 During this 90-Day Challenge I lost a total of 20 pounds and 7.4% body fat. I feel stronger, both in and out of bootcamp, and can tell a difference when lifting my 8-year old into and out of his wheelchair and carrying and repositioning him throughout the day. Thank you increased core strength! I have been able to achieve this transformation by: (1) Figuring out what works for me; (2) Planning ahead; and (3) Executing without excuses. Figuring Out What Works For Me. I like to know not just how to do something, but why. I am really drawn to books about the physiological and hormonal implications of diet and lifestyle. What I am finding extremely interesting and motivational is reading books such as It Starts With Food and following a Paleo-template nutritional program. As advertised, this style of eating has helped me regulate hormonal responses to food and has made it much easier to follow a healthy whole-food diet. I considered “two-a-day” bootcamps like others in the Challenge, but for me personally, it is more advantageous to focus on having one good workout (where I have been steadily increasing intensity throughout the Challenge as I gain more strength and stamina) and use that extra hour to focus on one of the other 6 primal needs Brien has identified. More times than not, it is the need for adequate sleep. Because I am chronically sleep deprived, that extra hour of sleep has benefits far beyond an additional hour of training. Planning Ahead. Last Challenge I learned to quickly move on from slip-ups and immediately get back on track instead of giving up on a healthy lifestyle. This Challenge I learned something even more valuable: to plan ahead to avoid most of the slip-ups in the first place. I put my bootcamp sessions on my calendar first, and plan the rest of my obligations around them, to the extent possible. On days I have a schedule conflict, I run a few miles on the treadmill, or take my kids for a walk in the double stroller on the Bay Trail. I asked Brien for a few great bodyweight-only workouts to do when traveling. The nutrition side of the equation is where planning really pays off. The prep-intensive Paleo-template has always been hard to jump right into, so I did Designs for Health Paleo Cleans and Fat Loss programs for the first four weeks to be able to ease into preparing whole-food meals. That way I only had to focus on preparing one meal a day, until I became more efficient and comfortable cooking meals from scratch. I bought an Instant Pot and a Spiralizer (game changers!) On days I can’t cook, I use the website “Once a Month Meals” to help me batch cook and have frozen meals at the ready. For days that doesn’t work, I buy a rotisserie chicken from Whole Foods or some canned tuna. If I am really strapped for time, I grab an Epic bar to get me through to the next meal. Executing Without Excuses. The winner of the last Challenge wrote in his essay that “[t]here are no excuses; people make excuses, your body doesn’t.” And I’ll admit it, I laughed when I read it, thinking that his perspective was a luxury. What about people like me, someone whose partner works out of town four days/nights every week, with young children, in particular one who is severely disabled, non-verbal, non-mobile who requires my complete attention at all times? Focusing on my own well-being can be impossible. Well, the joke is on me, because I’ve come to realize he is absolutely correct. The repercussions of poor diet and lifestyle choices don’t care if you have a “good excuse.” Poor sleeping habits will have the same adverse effects on health whether they are due to monitoring a child with a nocturnal seizure disorder, having too much stress from work, or partying every night. Everybody has lifestyle challenges, and those with more difficult paths do not help themselves by making excuses. They, ahem, I, just need to be more creative and steadfast to overcome those roadblocks. My son has seizures at night. That is not going to change, so in order to get a good night’s sleep I have to go to sleep when he does. I don’t want to do that. I want to stay up and watch Game of Thrones. But I don’t. If I want my health to change, then I have to change my habits, without excuse. Looking for the magic formula that would take my existing lifestyle inputs and come out with a better result is a waste of time. There will always be an excuse or justification, the merits of which are irrelevant. The bottom line is, the most stress in your life, the more you can benefit from a healthy lifestyle. I am proof of that.